WHEN I WAS A CHILD, THE BIBLE WAS AS TIMELESS AS MY PARENTS. 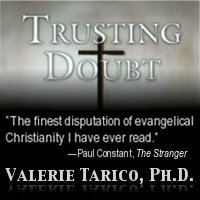 Gallery | This entry was posted in Trusting Doubt: Individual Chapters and tagged Bible worship, biblical inerrancy, biblical literalism, bibliolatry, deconversion, higher criticism, recovery from religion, text worship. Bookmark the permalink. Excellent articles! I’ve enjoyed reading them immensely. Keep up the good work!